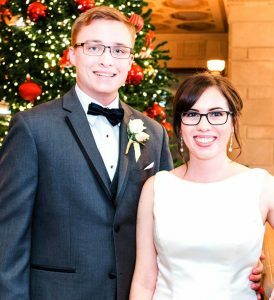 Lisa Sturgill, daughter of Scott and Jeanie Sturgill of Ashland, and Michael Oesch, son of Larry and Vicky Oesch of Salem, were united in marriage in a double-ring ceremony at 4:30 p.m. Oct. 14 at the Tudor Arms Hotel in Cleveland. Pastor Ryan Rodeman of Grace Church in Bath officiated. Music was provided by Athena Strings. A loose, rounded, hand-tied bouquet contained cafe au lait dahlias, blush garden roses, quick sand roses, blush spray roses, white ranunculus, white stock and seasonal blooms. Dusty miller, gardenia foliage, seeded eucalyptus and seasonal foliages were used for vining throughout. The stems were gathered with ivory double satin ribbon and ribbon streamers. 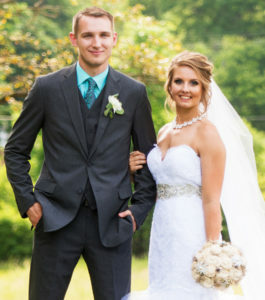 The matron of honor was Melanie Bates of Akron. Bridesmaids were Heather Moor of Hendersonville, N. C., Rachel Reed of Akron and Lindsey Riley of Stow. 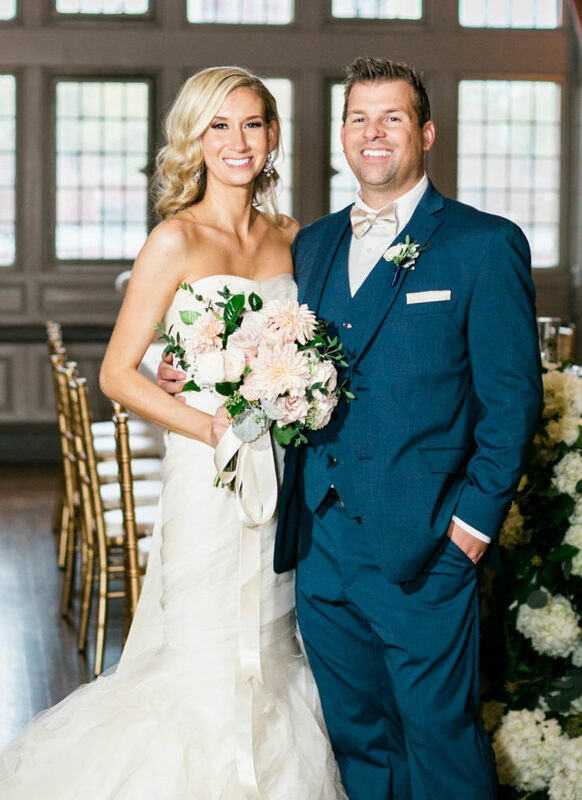 They wore floor-length dresses made of soft tulle in varying neutral colors of gray and tan and carried looser hand-tied bouquets of quick sand roses, blush spray roses, white stock and seasonal blooms. Dusty miller, gardenia foliage, seeded eucalyptus, and seasonal foliages were used for vining throughout. The stems were gathered with ivory double satin ribbon. Grace Gruebner, the bridegroom’s niece, was the flower girl. Ryan Heckert of North Canton and Micah Riley of Stow were the best men. Groomsmen were Eric Knight of Punta Gorda, Fla., and Andrew Landies of Novato, Calif.
Ushers were Kevin Gruebner of Orlando, Fla., the bridegroom’s brother-in-law; and Bobby Stark of Akron. Approximately 120 guests attended the reception at the Tudor Arms Hotel. 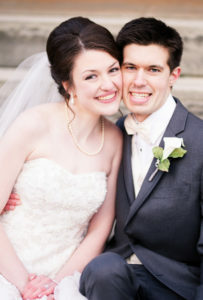 After a honeymoon in Hawaii, the couple resides in Canton. 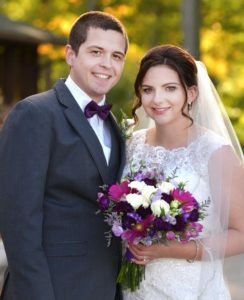 The bride graduated from Ashland High School in 2008 and received a bachelor’s of arts degree in accounting and a minor in Spanish from Walsh University in 2012. She also received a certified public accountant license in January 2015 and is employed as the accounting manager at Employers Health in Canton. 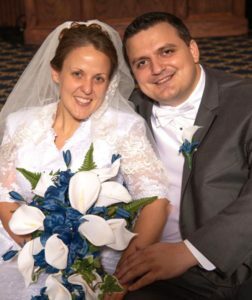 The bridegroom graduated from Salem High School in 1997, earned a bachelor’s of arts degree in business administration from Malone University in 2001 and a master’s of science in accountancy from the University of Akron in 2005. He received his certified public accountant license in 2007 and a certified fraud examiner license in 2016. He is the senior manager at Veritas Solutions Group LLC in Canton.